There’s a place in Tuscany that’s 30 minutes away from Pisa and Lucca…and it’s NOT Florence. It’s a place with the most incredible pastries filled with nothing but secrets, dreams and unicorns. It’s a place that holds one of Italy’s most famous carnival with floats made out of paper mâiché dangling with naked politicians, rockstars and inspiration. This, my dear, is Viareggio. Viareggio is a special place with extraordinary people and succulent dough filled with chantilly cream, which is why it’s been added to my #BestofTuscany tour. 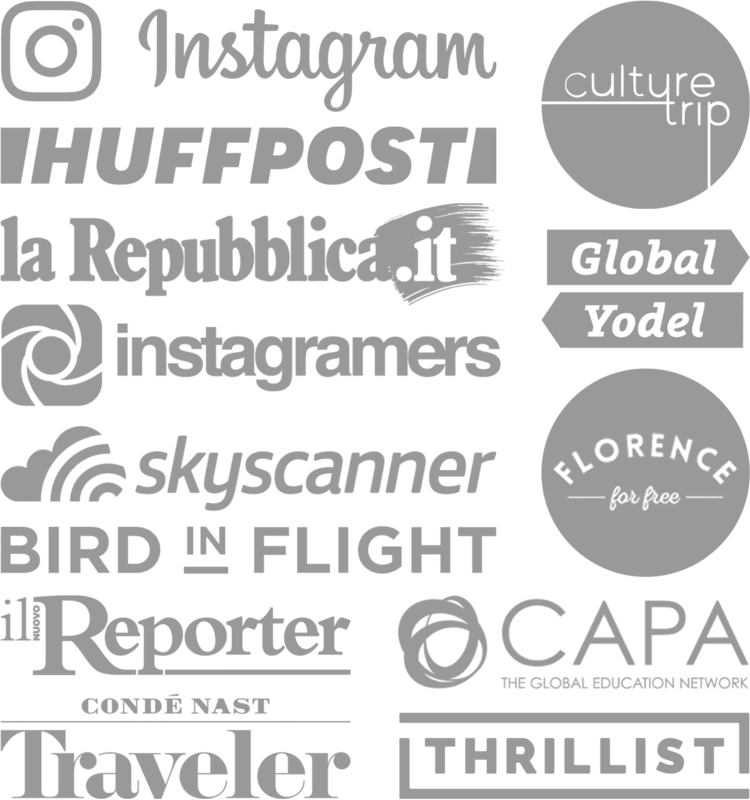 The tour’s goal is to see the best of Tuscany all year long and so far so good! 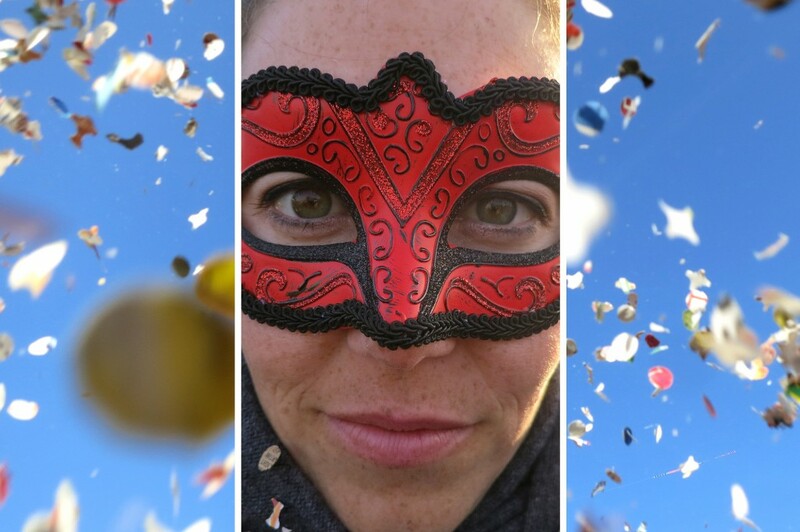 I was invited along with a group of bloggers, instagramers and journalists to witness the sensational Carnevale! We met at Cittadella del Carnevale—a mini city where the owners, designers, engineers and workmen work non-stop for months every year to prep for carnival. 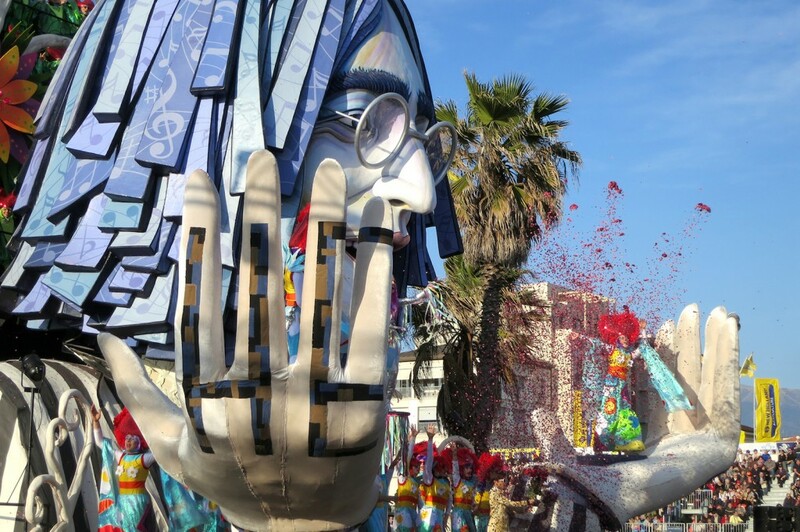 Each float hands in their drafts by September and then hit the ground running in January to be ready for Carnevale in early February…lasting until March. 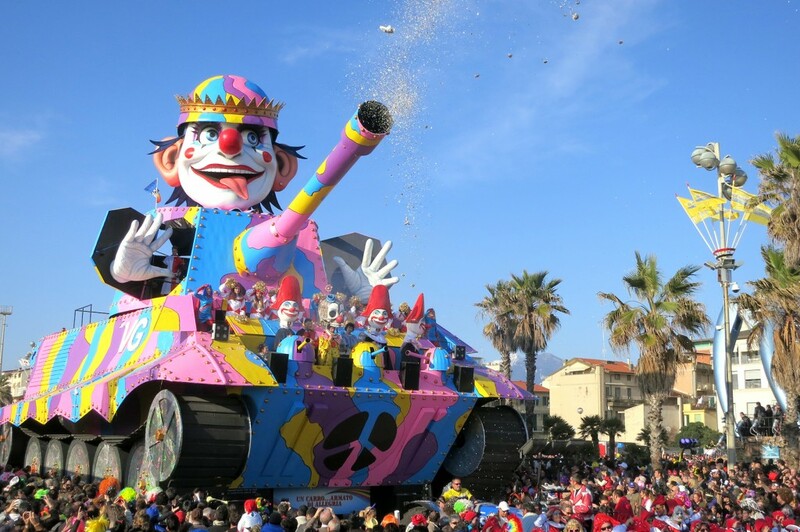 Floats range from 100,000€-170,000€, all of which is supposedly provided by the city and the region. After touring the floats and meeting some of the brains behind these complicated paper structures, it was time to get our hands dirty with making paper mâiché objects at Le Botteghe della Cartapesta. There were shelves filled with molds in the form of masks, frogs, zebras and antelopes. The antelope’s horns called to me, so I got started right away. After about an hour I was done laying sopping newspaper into the mold and we set it to dry over night…now it’s hanging in my living room! 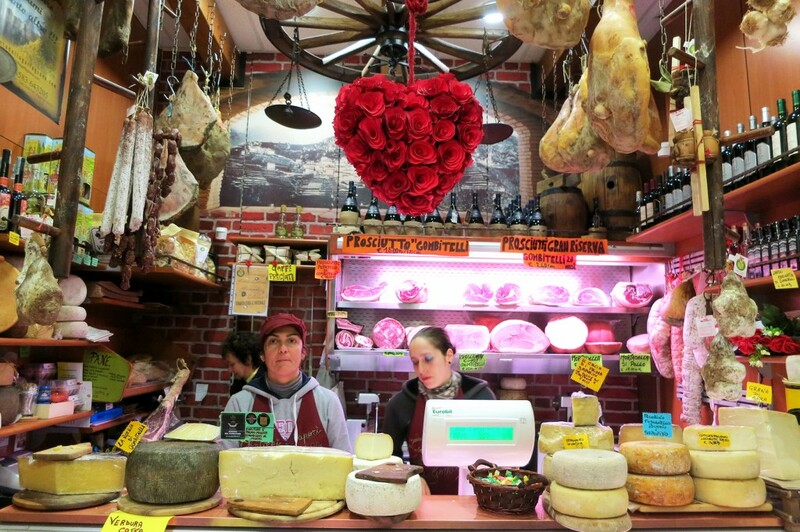 Viareggio is… pastries, prosciutto and cheese, oh my! After all that hard work, seriously making an antelope mask was difficult, we drove to the center of Viareggio and walked to the Mercato area were there’s this contagious energy. I’ve been coming to Viareggio for years and have never swung around these streets. 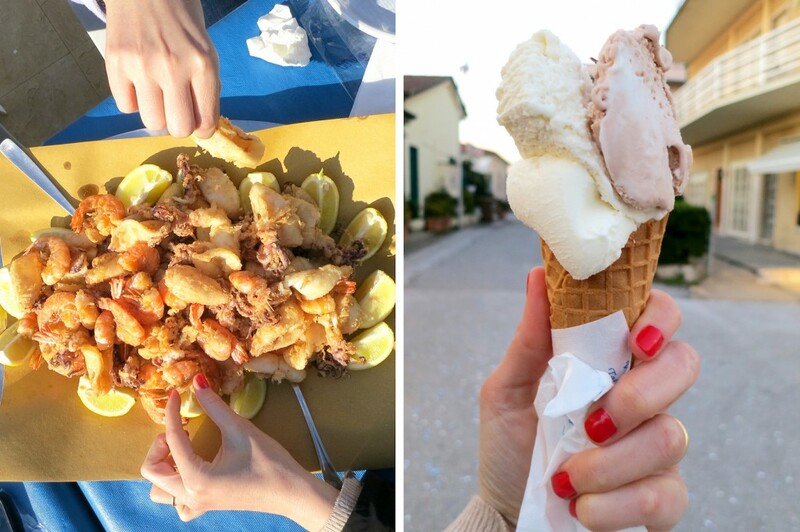 This area’s filled with street vendors, friends arching over plates of fried calamari, kids endlessly soaking in the joy of each bite of gelato and bicycles rolling through the colorful streets. 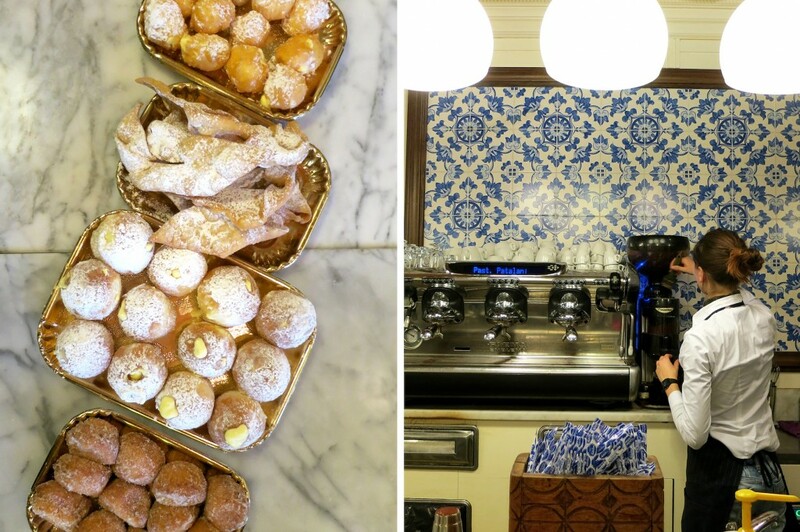 There was a long table reserved for us at Pasticceria Patalani, which is the most famous pastry shop in town…and according to my taste buds, in Italy. Seriously. We tried bomboloncini con crema chantilly (cream injected in sugary balls of fried dough), frittelle di riso (sweet fried balls of rice), ondine (cookie plastered with powdered sugar), cenci fritti (fried carnival specialty) and cenci al forno (baked carnival specialty). Many of these are typical for Carnevale meaning I had to eat each one, you know, for research purposes! I was somehow able to walk out alive with a powdered sugar smile plastered on my freckled face. Time for the best local salumeria around, I introduce you Salumeria Triglia. I posted a pic on Instagram claiming this was heaven and it is. The owners served us prosciutto, salami, soppressatta, porchetta all on amazing bread. It was not typical stale Tuscan bread, but bread you would even eat alone! Then cheese platters came out and before I knew it there was a cup of rosé in my hand. Salumeria Triglia is famous for their high quality products that come from the hills right behind in Camaiore. I actually go on hikes right around there to a little town called Pedona, great for mountain bikers too! As a young wide-eyed student eleven years ago I first experienced Carnevale Italian style both in Venice and Viareggio in the same breath. Should I mention with a pierced nose as any good American student does? Now it was time to experience it again, minus the booze and cans of silly string…and pierced nose! We all met up at Bagno Perla del Tirreno for a seafood lunch while we relaxed and watch the first round of the floats go by. You can’t go wrong with seafood risotto and fried seafood, right? After all the meat in Florence I always appreciate some fresh seafood! After lunch we hit the streets dodging silly string and hand fulls of confetti launched at light speed. I ended up in a confetti fight with a fellow instagramer‘s nine year old son. I’m not sure why I thought his innocent looks would not be capable of chucking kilos of confetti at my face. Now I know what it’s like to have paper stuck to the back of my throat. 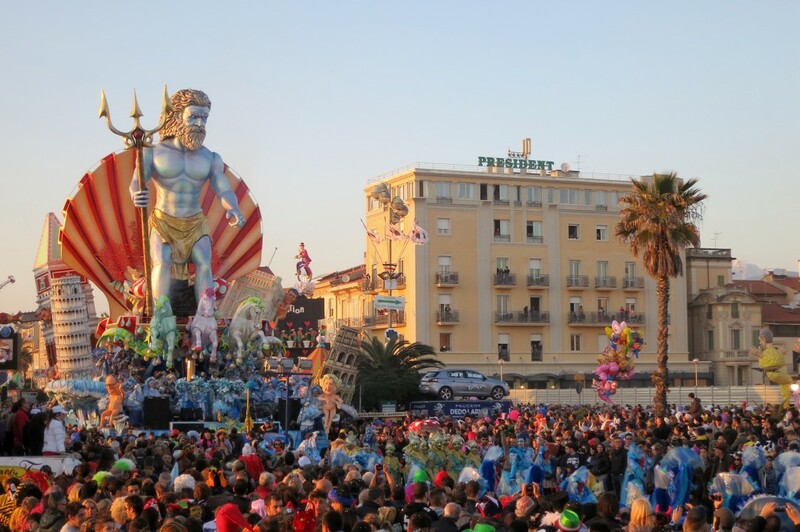 That wraps up carnival until next year, BUT don’t let that stop you from visiting Viareggio at any time. It’s great for families, couples and anyone ready for a bomboloncini party in your mouth. A special thanks to Serena for putting this special tour together for the few of us! 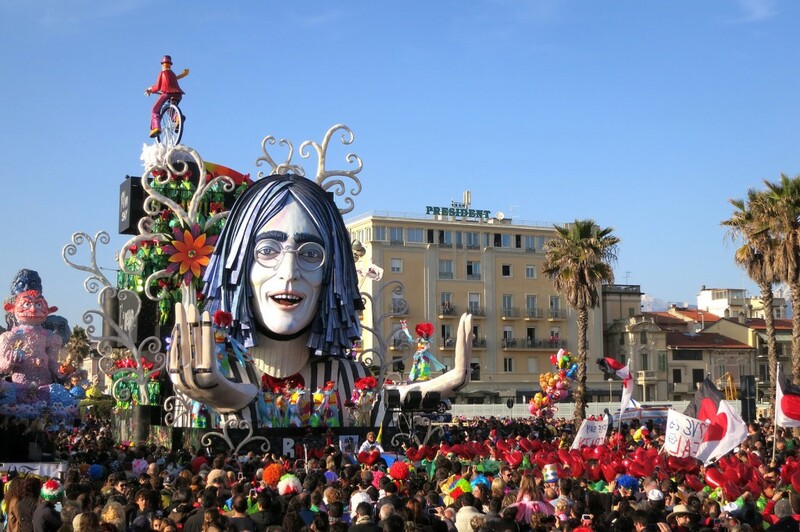 Have you ever celebrated Carnival or even heard of Viareggio!? “OH MY” is right, I’ll take some of those pastries please! 🙂 I would enjoy this Carnevale so much with all the great food and spectacular colorful displays. Fun story! Love the photos! So much colour and looks like so much fun! Thanks Becky! It so fun, such a great event to look forward too. The locals really get into it!